When Moore & Gibbons began the process of creating Watchmen, they wanted to create something different, something that stood out from the other comics on the spinner racks. These two artists strove to tell a story that not only utilized adult themes, but also used techniques not often seen in comics, such as foreshadowing and symbolism – aspects more often related to prose rather than comics. They set out to craft something special. But they also needed the “package” to stand out. If the imagery, particularly the cover, was not distinct, why should people bother buying the book? Moore & Gibbons knew the covers had to be bold, had to have consistent design elements to make subsequent issues easily recognizable, and had to be something not available on the hundreds of other covers populating the racks. To that end, they approached these covers with a different design sense than was typically employed in comics. 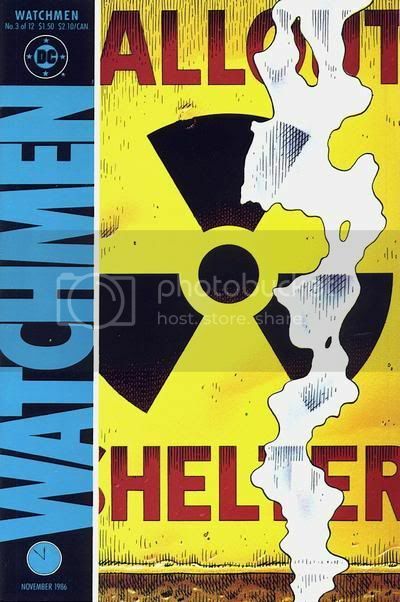 Each issue of Watchmen had a similar cover layout, with a few, simple design elements. But the way Gibbons arranged those elements was, and is, striking. Having the title run up the side of book is the first thing that stands out, changing the dynamic of these comic covers dramatically. And, along with the requisite publishing information in this sidebar, a clock was included toward the bottom left corner. Over the course of the series, this clock would count from 11 minutes to midnight down to midnight, symbolizing the march to Armageddon permeating the narrative. 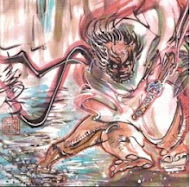 Then there were the cover images. Famously, these pieces of art by Dave Gibbons were actually the first panels of each chapter. This was something that had never been done before, to my knowledge, and possibly something that had never even been considered. I imagine the initial idea was greeted with skepticism by some, but after that first iconic image of the blood-spattered smiley face button in a gutter drenched in blood, I imagine many skeptics were persuaded otherwise, or at least quieted a bit. And Gibbons did not rest on his laurels, infusing design elements into all of the covers – like the skeleton formed from the wafting smoke on the cover to Chapter III or the smiley face motif hidden within the radar screen on the cover to Chapter X. It was an audacious approach that paid off for creator and reader alike. But the front cover wasn’t the only aspect of the comic package that Moore & Gibbons chose to appropriate to their design sense. A unique aspect of Watchmen was the fact that the entirety of each issue was given over to the story – no house ads, no letters pages, no outside advertisements. Even the inside covers were free of ancillary material as, over the course of the twelve-issue serialization, this double-page spread had the title of the book scroll across its “screen.” The letters stretched the full height of the book, and it was one more thing that added to the feeling of this being something new in comics. And finally, there were the back covers. That first one was unassuming. 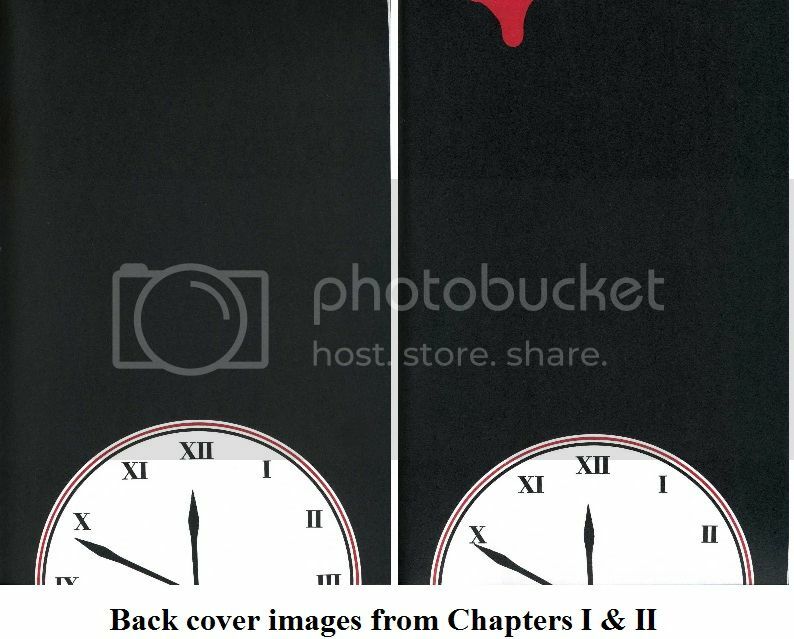 The upper half of a clock resides in the lower part of the back cover, which is completely black otherwise, with hands that read 12 minutes to midnight (a miscalculation on someone’s part). With the next chapter, it became obvious that something more was going on with the back covers. 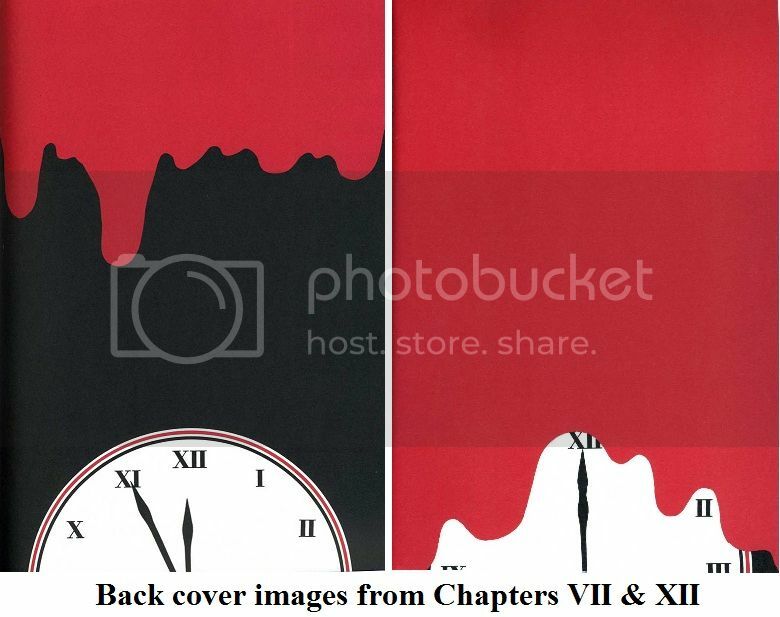 The clock hand has moved ahead one minute so that now it is 11 minutes to midnight (with Chapter III it would jump ahead to 9 minutes before midnight, so the clock hands would end at midnight with Chapter XII), and blood is starting to seep downward at the top of the image. Over the course of Watchmen’s serialization, that blood would spread over the back cover while the clock ticked ponderously toward midnight, until that final chapter where most of the black, and much of the clock, is consumed by the blood. It’s a stark visual that emphasizes the themes of this book, and was the final touch – as one closed each issue – in what was a wholly distinct comic reading experience in 1986. 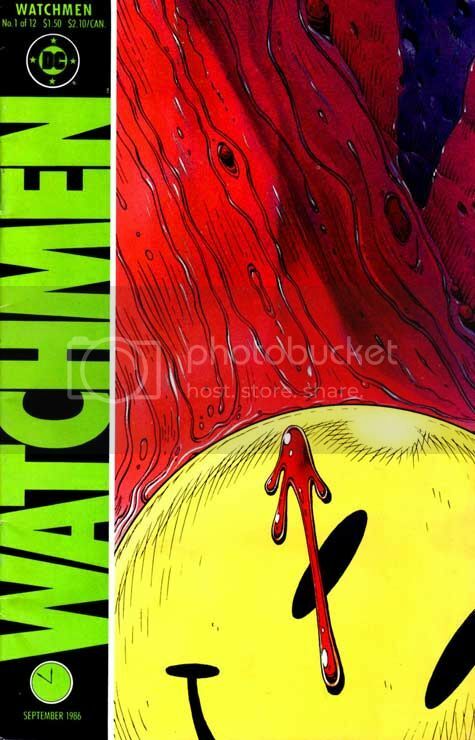 Labels: Alan Moore, analysis, chrisbeckett, cover image, Dave Gibbons, Watchmen, Who Watches the Watchmen?